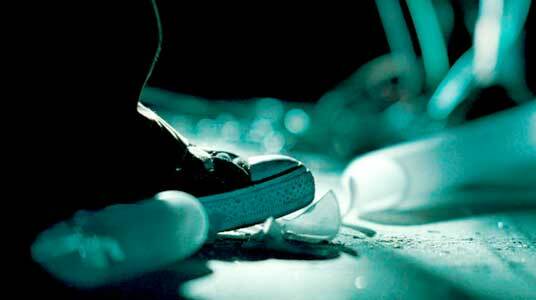 Jackson Bond wears black low cut Converse “Chuck Taylor” All Stars in the film. Carol and Oliver try to escape the people infected by the epidemic. The Invasion is the fourth film version of The Invasion of the Body Snatchers, and it has been updated for the 21st century. Instead of pods hidden in swamps that have taken over human bodies, this version relies on a virus from outer space that spreads like a flu epidemic. As the story begins, news is broadcast the the space shuttle has crashed to earth. What isn’t known is that the shuttle was deliberately attacked by an alien meteor which attaches to the ship and brings the virus to earth in the form of crytalline rocks. Once humans touch the rock, the virus invades but it doesn’t actually activate until the person goes to sleep. When they wake the next day they are changed and controlled by the virus. Their personalities become zombie-like, unemotional and disengaged from normal human desires. Their only goals are to spread and protect the virus until it has taken over the world, although this isn’t realized at first. People say things like “My husband isn’t his normal self anymore,” and dogs start barking at their previous owners. One of the first persons to be infected is Tucker Kaufman (Jeremy Northam), who just happens to be a top administrator in the Center for Disease Control. The film then switches to Washington DC where we meet psychiatrist Carol Bennell (Nicole Kidman), divorced from Tucker a few years back and living there with their son Oliver (Jackson Bond). We also meet her current boy friend, Ben (Daniel Craig), who is a medical researcher. Because of their professional fields, Carol and Ben soon notice the unusual things that are happening. A third acquaintance, Dr. Stephen Galleano (Jeffrey Wright), who works for the Center for Disease Control is able to confirm the strange and ominous nature of the disease that is beginning to spread throughout the country. When Carol is finally able to find Oliver again, she doesn’t know whether he has been infected or not. At the personal level, things begin to develop when Tucker gives Carol a call and says that he wants to spend some time with Oliver, something very surprising to her because he has shown little or no interest since their divorce. Carol and Oliver have grown very close, and although she is very reluctant to let Tucker have Oliver for a weekend, she has no plausible reason to say no. The visit scenario is made even more believeable because they will be staying at a mutual friends house, who has a son Oliver’s age. Besides, Carol and Ben have been invited to an important dinner party given by Hungarian diplomat Dr. Henryk Belicec (Josef Sommer) and his wife Ludmilla (Celia Weston) where they discuss politics and international affairs with the Russian ambassador (Roger Rees). But soon Oliver is sending her text messages saying how strangely his father and their friends are behaving. Carol realizes that she must get Oliver back and then escape from the city. This is now more and more difficult, as the infected people have taken over much of the governmental functions of the city, and set up “vaccine centers” to make sure that the entire populace eventually become virus people. The only way for her to get around in public is to emulate their behavior and be careful to stay away from anyone who can detain her. Eventually she locates Oliver and is able to see him. In a pivotal scene, they look at each other, worried that the other has contracted the virus. When Oliver admits that he has slept but exhibits no signs of the infection, Carol realizes that he has a natural immunity to the virus. 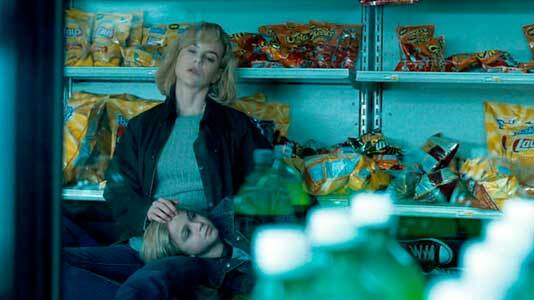 Now it is more important than ever that the two of them escape, but since Carol has been exposed, she must not fall asleep or she will become one of them. After they go on the run, the word quickly gets out that Oliver is a threat to their existence, and the balance of the movie is made up of chase scenes and attempts to get Carol and Oliver out of the city and to the safety of Dr. Galleano and his disease control team. Oliver falls asleep in the drug store. The Invasion starts as a film that has a lot of potential, and might have been a very outstanding film if it was able to break away from the “remake, predictible action/adventure ending” genre that defines the industry today. There are some interesting threads to the story line: a real modernization of the original plot that uses a flu-like epidemic to take over the world, the use of cell phone technology to help thwart it, a political premise that maybe world peace could be obtained if everyone became infected, and the survival power that a close family relationship can generate. But Warner Brothers did not like director Oliver Hirschbiegel’s original version of the film, so they brought in the Wachowski Brothers and another director to add action sequences like you would see in a Die Hard or James Bond film when the fate of the world is involved. The result is a schizophrenic blend of action/adventure sequences with Hirschbiegel’s moody suspense scenes. The film is well cast and the audience can easily empathize with the characterizations and portrayed by Nicole Kidman, Daniel Craig, Jackson Bond, and Jeffrey Wright. The dinner party scene with Josef Sommer, Celia Weston, and Roger Rees has interesting dialogue and gives the viewer a worldly perspective of what is starting to happen in the plot. In the long run, it’s a lot more effective when you see Nicole Kidman walking down a city street trying to emulate the disengaged, emotionless behavior of one of the virus people than to have her pretend to be a stunt driver crashing through cars and people on those same streets. You also get a lot more suspense when the enemy could pop out from anywhere, instead of being defined by cars and helicoptors. 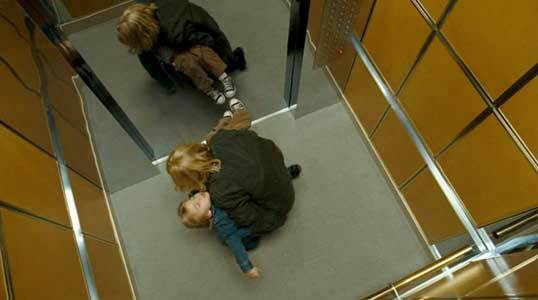 Carol carries the exhausted Oliver up a high rise elevator to a helicopter landing pad. Oliver steps on some broken glass. 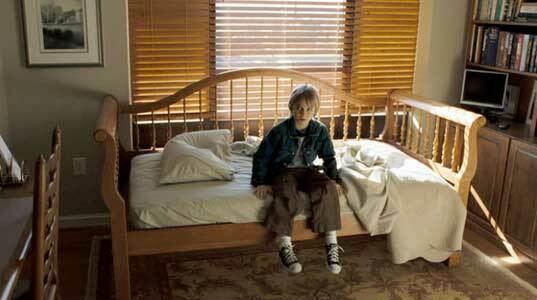 Oliver, played by Jackson Bond, wears low cut black chucks throughout the last part of the film. As this is the main sequence in which he appears, and a pivotal portion of the story, the chucks are a reminder of normalcy in a time of great upheaval and lunacy in the world. There are several closeups of them during this portion of film, as he and his mom are desparately trying to escape from the ever increasing population that have been taken over by the virus. 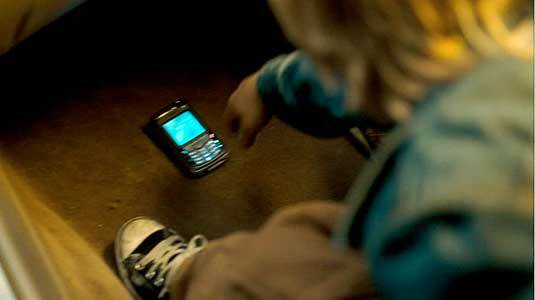 Oliver goes to grab the dropped cell phone that he and his mother must have to communicate with the disease control center. The Invasion. (2007) Nicole Kidman, Daniel Craig, Jeremy Northam, Jackson Bond, Jeffrey Wright, Veronica Cartwright, Josef Sommer, Celia Weston. Directed by Oliver Hirschbiegel. Categories: Science Fiction, Action/Adventure.